Formulated for the severe operating conditions of today's pick-up trucks, SUVs, heavy equipment and other hard working vehicles. AMSOIL SEVERE GEAR® Synthetic Extreme Pressure (EP) Lubricants are premium grade gear oils specifically engineered for maximum performance in severe duty applications. These state-of-the-art AMSOIL formulations feature an exclusive blend of high viscosity, shear stable synthetic base oils and an extra treatment of high-performance additives. AMSOIL SEVERE GEAR® Synthetic EP Lubricants maintain their viscosity for long-lasting protection against metal-to-metal contact. The proprietary AMSOIL additives form an iron-sulfide barrier coating on gear surfaces, providing the ultimate line of defense against wear, pitting and scoring. AMSOIL SEVERE GEAR® lubricants help prevent "thermal runaway" - a phenomenon caused by a lubricant's inability to control friction and increased heat under high-stress conditions. By controlling thermal runaway, AMSOIL SEVERE GEAR® Synthetic EP Lubricants inhibit rapid lubricant degradation and component damage. Equipment runs better and lasts longer with AMSOIL SEVERE GEAR® Synthetic EP Lubricants. For product service life in differentials, consult yourowner’s manual or the Original Equipment Manufacturer(OEM) to establish the application, NORMAL or SEVERE. 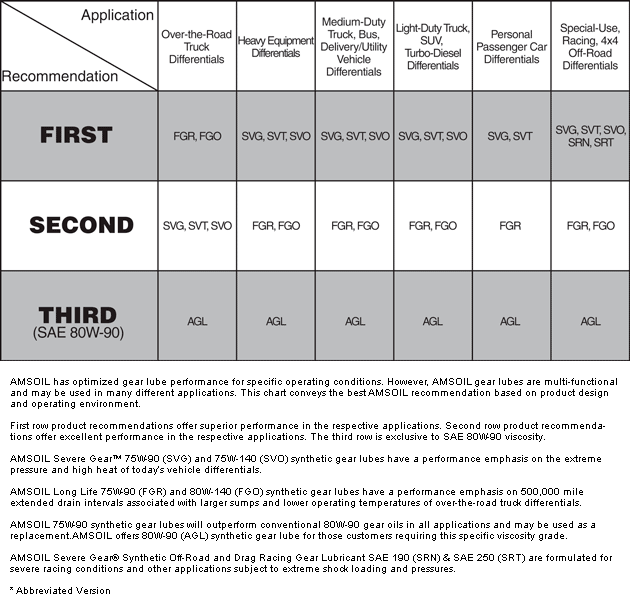 For product service life in non-differential applications,consult owner’s manual or the OEM for either normal orsevere synthetic oil service intervals. Where service intervalsare unavailable, drain at twice the interval for conventionaloil. Gear oils should be changed more frequently when operatingvehicles or equipment in dusty or dirty conditionsunless the gear system is properly sealed and equippedwith membrane type breathers. Note: AMSOIL does not support extended drain intervalswhere water contamination occurs. Check and service thegear oil frequently when water contamination is possible. Recommended for use in differentials, manualtransmissions and other gear applications requiring anyof the following specifications: API GL-5, MT-1,MIL-PRF-2105E, Dana SHAES 234 (Formerly EatonPS-037), Mack GO-J, or the differential (hypoid) gear oilspecifications from all domestic and foreign manufacturers such as GM, Ford and Daimler Chrysler. Can also be usedin axles where an API GL-4 lubricant is recommended. AMSOIL SEVERE GEAR® (75W-90) provides superiorperformance and replaces competitors’ 75W-90 and 80W-90 gear oils. It delivers the best fuel efficiency and cold temperatureperformance of the SEVERE GEAR oils. AMSOIL SEVERE GEAR® is compatible with conventionaland synthetic gear oils. 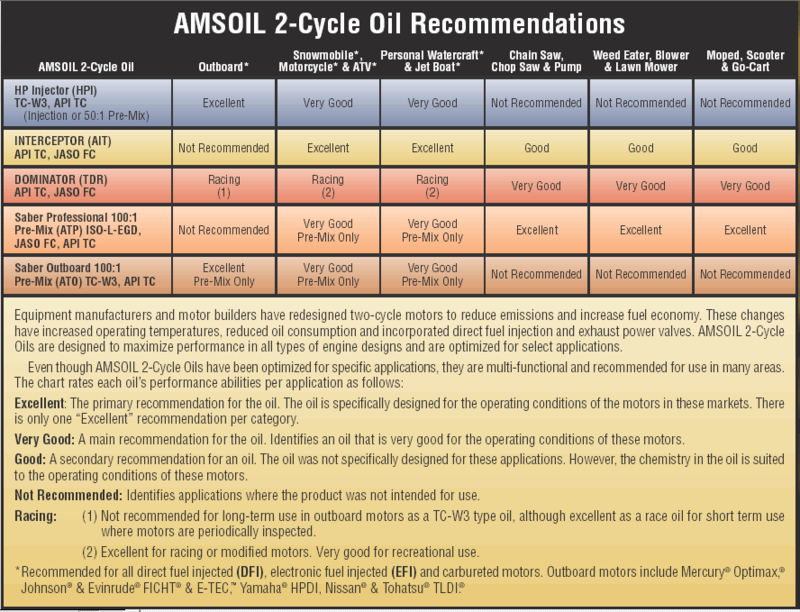 Mixing AMSOIL gear oils with otheroils, however, will shorten the oil life expectancy and reducethe performance benefits. AMSOIL does not supportextended drain intervals where oils have been mixed.Aftermarket oil additives, other than those specified byAMSOIL, are not recommended for use with AMSOIL gearoils. Click here to view the MSDS Data Sheet for AMSOIL SVG. Votes & Reviews: 158 vote(s) and 134 user reviews. Used this in my 18 Ram 2500. Reading some forums, some people had to use limited slip additive in their rear diff because of some chatter even though they have a torsen style limited slip with no clutches. I have not had any of this chatter with this oil. After 100,000 miles on my 2008 Tacoma I switched to Amsoil and saw noticeable smooth shifts out of my manual transmissions especially in colder weather. So far, so good. Running it in a FJ cruiser. Made my unshiftable 2001 Audi TT 6-speed shift like new again in less than 200 miles! Used on my Silverado .Runs great ! Haven't used any other fluid. Change my differentials fluids every 2 years, will not use any other. I use the full line of amsoil products in my home garage/shop and have been very satisfied with all of them in all of my personal cars, powersports, and customer vehicles. Hard to know exactly how this will perform long-term, but since I have 100Ks of miles using all manner of AMSOIL products in cars, motorcycles, ATVs, tractors, and small equipment, I also have no doubt this is a top notch oil and I'll likely never have to replace this oil in my Outback again. The peace of mind I get with AMSOIL products and the ability to have extended drain intervals is second to none. I've used Am's oil for almost 25 years now in racing , hauling , commuter car and even my hoists use it . In all the years I've used Am's oil I've never had a component fail that was useing it . For the most part the higher initial cost is offset by the longer service intervals . At 30 below I've seen the Am's oil 5w30 and conventional 5w30 . The Am's oil pours nice and the conventional was like year. I have ran this gear oil in every vehicle I have owned. I trust it more than whatever they put in at the factory. It is good for everything I do from going fast down the interstate to pulling heavy loads. I also use it in my chain case in my skid loader. It's a great all around gear oil. Meets or beats all OEM gear lube. Use this in my 2008 Mitsubishi lancer evo x gsr. Transmission, transfer and rear diff all operate alot smoother than ever before. I am really happy with the product. Not to mention there real easy to pour or siphon. I have purchased this item many times. I have several motorcycles with driveshafts and I use this product for the final drive oil. I prefer to use Amsoil products in my vehicles because of their reputation for developing quality products. A am pretty sure this is good gear oil, lots of good reviews. I can not test the stuff self, I am just an end user. Will probably buy again. Love it, better in all aspects than all other products. I commute 1500 miles a week. Amsoil is clearer at changes than all other products i have used. There is no doubt that it is the best on the market, And I spend less $$$. Will be customer for life. Use in all my vehicles, noticeable difference especially rearend a which have lockers. I bought a case of this to replace what is in the rear end of my tundra and it is a great product. The truck tows frequently (3x a month for 100 miles at a time) and I wanted to have a quality oil in there. Used this in transfer case and diffs of a 2013 FJ Cruiser for 30k miles. Vehicle is daily driver and upgraded and abused off road. Stock fluid after 30k was dark and separated in appearance. After 30k with AMSOil Severe Gear, the front diff AMSOil fluid looked almost new with significantly reduced metal shavings. The rear looked only lightly used with once again significantly fewer metal shavings. I highly recommend this fluid! I have used this product on applications calling for 75W-90 on Ram/Chevy/GMC trucks & SUV'S. To date I have been using this product for about 17 years and with no issues. Thank you. I run this in my 95 k1500 front and back diffs and my 05 2500hd duramax front and back diffs. Great stuff works very well I've never had an issue.im happy to know I have the best protection from the elements so it's peace of mind running this stuff. This is a great gear oil . Can't go wrong with this product. Replaced OEM front and rear differential fluids of a new 2017 AWD Subaru Outback, and refilled with this 75W-90 product at approximately 3000 miles. With OEM fluids, an infrequent driveline 'clunk' used to occur when making tight (e.g., U-) turns. This behavior has NOT occurred (in over 2500 miles) since after refilling with Amsoil's synthetic Severe Gear differential oil. For our vehicle, changing out the differential fluid shortly after 'breaking-in' the differentials seemed to be a good choice (judging by the drain plug magnet debris). I obviously can't comment about product longevity, but with the elimination of an infrequent driveline 'clunk', we're extremely pleased thus far! Used for rear gear oil changed in 2005 Chevy Duramax. Works as described have used before and was pleased with Performace when towing boat, looking forward to the future performance of severe gear oil. Replaced the factory fill with two quarts of severe gear. As with all other AMSOIL products that I use in everything I love it and recommend all their products to everyone who cares about their investments. Working good. Truck pulls 15000lb camper 90% of the miles. I haven't been using amsoil for long, but I have been happy with everything I've purchased so far. Will continue to use amsoil fluids throughout our vehicles. Works great. Pick up shifts quietly and the interval for changing the transfer case makes it a great value. Just don't get it spilled on anything clothing you like. AMSoil is the best there is! I use this product in all my vehicles. Wouldnt trust anything else. You get what you pay for and pay for what you get. Great stuff! I use 100% amsoil products. I have a modified camaro ZL-1 with 940 HP at the crank. The gear lube and engine perform flawlessly. I maintaing at least 3 to 4 lbs more oil pressure throughout the life of the oil. I will never switch brands. This is the best on the market. I've just did the second diff service on my Toyota Tundra. The oil that came out still looked brand new after 30000 miles. I'll go longer on the next service for sure. I would by this product from now on. Amsoil does not control friction modifier, so if you have a limited slip diff don't use the gear oil alone!!!!!! Been using this in my Z06 Corvette for a few years with some track time and very happy with the product. No need for a limited slip additive. Changing it this spring. I use AMSOIL for everything because AMSOIL is what is called a Reference oil. An oil that all other oil Mfr's aspire to be like. A bench-mark oil. Would not, could not use anything else!!! Every time someone asks what i put in my Differential's & Transfer Case, I tell'em AMSOIL. My front and rear diffs love this stuff !! Temps dropped considerably after swapping to this !! Use this amazing gl5 gear oil from the diffs in my duramax to the diffs in my 600whp Mitsubishi Evo. They are always ready for the challenge! Pull a 21000 lb fifth wheel about 20 percent of the time. Installed this in my differentials (4x4) at 30,000 miles and changed it again at 150,000 miles. Old fluid looked and smelled just like the new Amsoil I replaced it with. No metal on magnets no seal leaks. My truck's fluids are all Amsoil. Great products and so is the service. Always performs well and has protected my gears for literally hundreds of thousands of miles with never a failure. It works as advertised Great product. Takes a LICKIN and Keeps on TICKEN!!!! I own a 2002 4 wheel Drive Chevy Tahoe. I'm a Tournament Fisherman, and I use my Tahoe to tow Thousands of Miles every year. I have Always used AMSOIL Series 3,000 5W/30 in the engine, and also use AMSIOL Severe Gear 75/90 in Both Front and Rear Differentials Without ever having any driveline Problems with my 14 year old Chevy. Put this in my 1995 Corvette differential with limited-slip clutch packs. 10,000 miles so far and no issues. I purchased the AMSOIL synthetic product for its superior quality and long service life... will last longer and protect my vehicle better than conventional, so in the long run it's definitely worth the added cost. I installed the Severe Gear Oil in my 2013 Toyota Tacoma TRD Sport 4x4 and it works great. I put in my transfer case as well. Used this in my air cooled 911 trans. Much more smooth shifting. Bought this for a complete rebuild on my 2005 Dodge Ram 3500. I have about 1000 miles on it and it is still clear in the sight glass. Sounds a tad better too. I just used this product in the transfer case and front and rear differentials of an AWD Infinity. Used in a off road truck. no failures, change every 30,000 miles and is still clear as a bell. Used gear lube in transfer case in 2013 Acura RDX AWD. Working great. I have used Amsoil products in my entire driveline of all of my vehicles and equipment for years. I run Severe Gear in the transfer case and both differentials of my truck, and the rear differential of my high horsepower car. The benefits are: smoother and quieter operation, especially in cold weather; 1-2 mpg increase; much better protection. I do not use extended drain intervals, but there is always that option. I'm picky about my vehicles, I use this for the protection, better operation, and peace of mind. My new F-150 only has 15k on it now and I still haven't changed the front axle but I did switch the rear over to 75-140 at 10k. Had a ford ranger that I bought new and switch it's rear to amsoil at about the same mileage. I used it for my lawn service runner. It was over loaded it's whole life up until 102,000 when I was hit and they totaled it. I sold that rearend to another guy that was going to rebuild it with a spool and deeper gears. He called me back and said it looked like brand new inside. Pretty amazing considering what that truck went through. I have been using this product in all my vehicles, and have nothing but rave reviews. The product keeps the gears quiet, and it still looks clean at every chnage interval. I had got it to replace the old diff oil in both differentials in my 2002 Chevy Blazer LS, it works great, it accelerates smoother/ faster than the old oil, and it the vehicle had over 200,000 miles on it when I changed it, now it has over 201000 miles on it and it's still doing great! Of course I would buy again. Had the oil in the diff previously and came out slightly worn looking. 70k miles. Never had any issues so far with the Limited Slip Diff locking up. Using AMSOil transfer tubes worked well also. Just had the car on ramps. I haven't had any issue and all gears have been working good. I typically do most of my own maintenance, but due to time constraints, I had my mechanic change the oil in the rear differential on my 2008 GMC 2500 HD truck. The truck is used as a daily driver plus towing my 10,000 lb. travel trailer. This is the second oil change. When I picked up the truck, the mechanic said "Wow, that Amsoil is amazing - the old oil looked great - hard to believe after 100,000 miles." He volunteered the response, I did not ask. I used Severe Gear in my FJ, 3/4 ton Suburban and two Porsche track cars. It is the best gear oil out there. I use Amsoil Slip Lock with Severe Gear for perfect, noise free operation of a limited Slip in the track car. Works great. I run this is my mini quads transmissions. It holds up better than anything else we have found. Always looks good and we seem to get longer life than the rest of the racers. I use this weight in my 91 Cummins W250, year round from -40 to +110. Front Dana 60, rear Dana 70 & the NP205 transfer case. No molasses effect in extreme cold & gear wear patterns should be optimal as always. Thank you Anne & Alex. Thank you Chip. 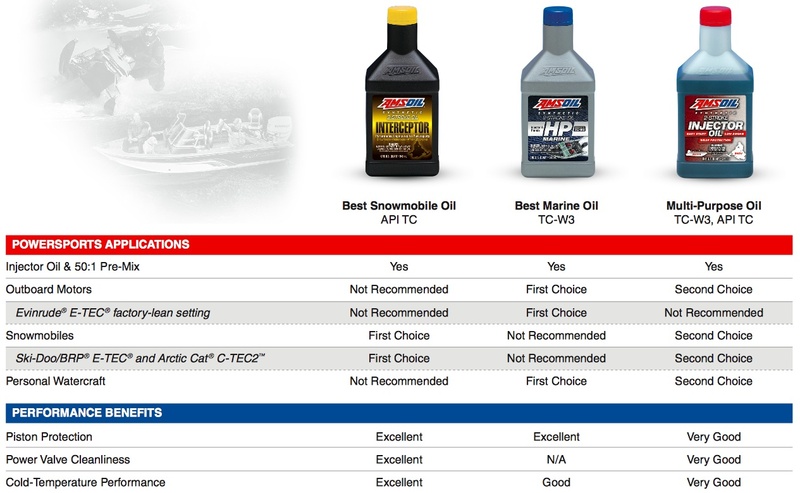 Just want to point out to other enthusiasts that the AMSOIL Online Product Application Guide will show them the correct viscosity for their application and whether or not Slip Lock additive is required. The guide also provides quantities required. Quite a handy tool.